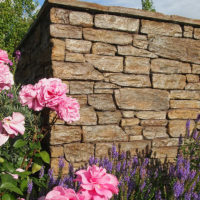 Classic Stone products are intended for interior or exterior non-structural use, as a lightweight veneer facing on masonry surfaces for architectural aesthetics. Classic Stone is cast in moulds from hand selected natural stones and coloured & textured to replicate the exact qualities of natural stone. These products are suitable for use on residential and commercial projects of many types. Classic Stone products are produced in preselected sizes and shapes. Installation is quick and easy, and is very cost competitive when compared with natural stone. Classic Stone can be applied over the following substrates: BGC fibre cement sheets, brick, concrete block & precast concrete panels. The walls should be clean and free from any contaminants e.g mould, paint or oils. Refer to the Classic Stone – Data Spec Sheet (available as a download file from the Technical page on this web site) for further information. How hard is it to apply? For the housing market Classic Stone has installers we recommend. However for other applications such as planter bins, retainer walls etc any competent tradesman or handyman should be able to install our products. Contact us for more detailed instructions. How durable is Classic Stone? Classic Stone is a high density, lightweight concrete veneer; it has been specially formulated to withstand long term weathering. 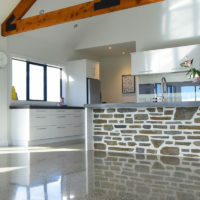 Classic Stone uses an integral stone base colour throughout the mix to give durability and quality. 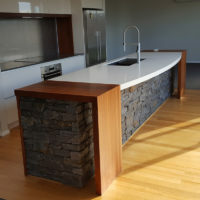 The veneer stone then has an additional colouring applied using some of the best artificial rock colouring systems known. These systems have been used throughout America for the last 30 to 40 years with no adverse colour deterioration. We produce our stone with slightly sharper colours than needed when new, with a little time they will weather back to a natural shade. How thick and heavy is the stone? Classic Stone is a veneer system. The stones are from 35mm to 60mm thick depending on the profile chosen. The average weight is from 30 to 50kg per square metre. Classic Stone is packed in cardboard cartons on pallets and can be sent anywhere in the country with ease. Because the stone is a lightweight veneer, it makes it very cost efficient. How does the price compare with natural stone? One of the major advantages is the price. 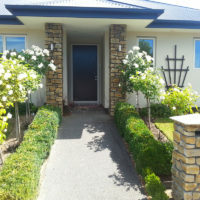 Because of the lower transport cost of Classic Stone and the speed and ease of installation, it is often far less than the price of natural stone. Can Classic Stone be used on both interior and exterior applications? Classic Stone is suitable for both exterior and interior applications and does very well in bringing an outdoor ambience – inside, by placing an emphasis on continuity in colour and texture. Can Classic Stone be used as paving for paths, patios etc? The Classic Stone product being a lightweight veneer is not suitable as a paving stone. Can Classic Stone be used to clad walls near swimming pools? While Classic Stone is highly durable, it is, like any other coloured concrete veneer susceptible to discolouration through exposure to chemicals such as chlorine. The Classic Stone product is well suited for above water level applications. Should the Classic Stone veneer come into regular contact with chemically treated water, we would recommend the application of a masonry type sealer periodically. Should the mortar be coloured? The overall appearance of a Classic Stone application can be enhanced when you tint the mortar to complement the stone colour. For further infomation contact your local installer or Classic Stone directly. Classic Stone is a low maintenance product. As with all cladding systems, stone should be checked annually for the effects of building movement or other external factors. A Classic Stone approved waterproofing sealer should be reapplied as required. This will be dependant on the surrounding environment and prevailing weather conditions. Occasional washing to remove surface dust and dirt may be required from time to time. Please contact Classic Stone for any further information. Does Classic Stone, meet Building Code requirements? Can Classic Stone be cut? Yes, Classic Stone can easily be cut and altered, using edge cutters, masonry blade etc. 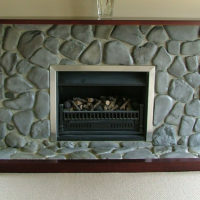 Can Classic Stone be used for fireplaces? Tests have shown that Classic Stone veneer does not produce flame spread, smoke development and does not aid the combustion process. Always check with local building authority to ensure that the design of the fire, substrates and use of stone veneer meets all building code requirements.